When you were a baby, when we lived in California, and before you could walk, I established a routine where I would take you to a patch of grass under a tree, lay out a blanket, spread out some toys, and watch you play. I would pick up different items and show them to you. I would watch you roll around, crawl, and explore with delight. It was the highlight of my day. I loved, loved, loved to watch you play. When you were a toddler and starting to walk, you became enthralled with stairs. Leaving you by yourself was not an option. I stayed with you, right by your side, as you navigated the steps, delighting in the challenge. What a grand adventure, scaling this mountain. Sometimes, it was a little stressful for me. I would want to be somewhere else. It was taking a little too long. Maybe I would want you to get to the top already, but of course the destination wasn’t the point at all. The point was the thrill of play and I loved, loved, loved to watch you play. When you were two and three years old and we lived in city of Prague in the Czech Republic, I would take you to the playground almost every single day. One of our favorite things to do was to find new playgrounds we had not explored. No matter the playground, in the Czech Republic there was a commonality…a sand box. We bought cheap sand box toys and packed them for each trip. I would sit on the edge of the sandbox and watch you dig your hands deep into the sand, sometimes for over an hour. You could push and smooth the sand over and over with a mesmerizing and soothing focus. It soothed and smoothed my own edges as I observed and commented on your movements. I loved, loved, loved to watch you play. When it was too cold to play outside in Prague, you would play in your room. You had a cheerful room in our flat, which was located in the district of Prague 6. Pink curtains. Pink bedspread. Pink carpet. The early morning sunlight reflected off the curtains and cast a pink glow over the entire room. You could stay in that room for long segments of time. I remember on one occasion fretting over how long you had been in there. I remember asking your daddy “Is it ok? Should I interrupt her?” You had, and still do have, an incredible ability to focus and entertain yourself. I would sometimes sit in the room on your bed just to be close. I loved, loved, loved to watch you play. In late preschool and early elementary school your little sister, just two years younger, grew to be old enough to be a playmate. Oh, how she loved to play with her sister. You were the orchestrator of grand ideas, complex worlds, and even the creation of an entire language. “Want to play ‘guys?’ “ Lillian and you would ask one another. That’s what you called it: playing “guys”. You two could spend hours in your shared room crafting play space. I would enter that space from time to time at which point you would stop immediately and stare at me. Perhaps, I was putting laundry away. Perhaps, I was getting an item I needed. The room would go silent and if I was taking a little too long you would say to me: “Mommy, are you almost done?” I was interrupting the flow of imagination. I would try to catch a glimpse of the creative furry. I marveled at the worlds imagined, the little houses made out of boxes, the way toys were used in ways completely foreign to their original intention. I loved, loved, loved to watch you play. In later elementary school years you, along with your sister and little brother, would sync devices and create worlds in minecraft. I would hear shouts to each other from your bedrooms. “What you are DOING? Don’t destroy my house!” There would be conspiring and laughter and regular fights over this world that existed only on your screens and in your minds. Then there was the “DIY” app that gave you projects to do and badges to earn. You made a sprinkler one summer out of a plastic coke bottle. So simple…and yet I was so proud of your initiative and independence. I loved, loved, loved to watch you play. These days you hide out in your room a lot. I don’t always know what is going on in there. I remember being in my room a lot as a teen so I try to give you your space (within reason). Sometimes I call for you and make you come out to be with me or whoever else is around. You read and do things on your phone. You have friends over and ask me to take you to Starbucks. I am intentional and try to say “yes” way more than I ever say “no”. I enjoy driving you around with friends. I find the middle school angst amusing. I poke fun at the sarcasm that seems to be the dialect of the early teen. This weekend you went on a trip with me…just the two of us. 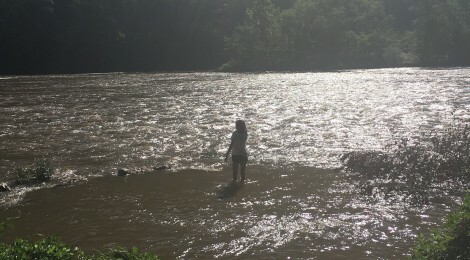 We camped in a tiny tent by the river in Hot Springs, North Carolina and I lugged you to sessions on spirituality, justice, arts, and music at the Wild Goose Festival. We teased each other relentlessly. You walked miles with me every day. When you were bored or hungry you let me know. You rarely complained. You were incredibly tolerant…a joy to have as a traveling companion. The day we were packing up to leave I looked out to see you wading in the river. You were balancing on some rocks. The sun was glinting off of the water and creating a glow around your long, lanky limbs. I caught my breath. I stared. I watched as you moved around with sweet carelessness. I looked over to see a beautiful stack of stones you had spent time building in the shallow waters by the rocky shore. And I saw her. I saw the little girl I took to the blanket every day when she was a baby. The toddler who climbed the stairs. The two and three year old who lost herself in the sand and toys in her room. The preschooler and elementary child who crafted worlds beyond the boundaries of her mind. The late elementary girl who built sprinklers and got mad at her brother for laying low her minecraft home. I saw her. I saw YOU. Lost in your own world. That same ability to focus and entertain yourself. I’ll always see you, Sweet Girl. Always. You are so, so, so beautiful, Sweet Girl…my oldest daughter who has raised me as a mom. And you are growing up. And, I still love, love, love to watch you play. As I sat and watched you in stunned silence I thought about all the times I have watched you play…how I LOVE watching you be…YOU…just you…and love watching you PLAY…thoroughly ENJOYING yourself. Without any expectations, any pressure, any “should’s” or “can’t’s”. And, I found myself wondering if maybe…just maybe…God loves, loves, loves to watch us play, too. Without any “should’s” or “can’t’s”. Showing us different things to explore with delight. Standing with us as we scale mountains where the destination is not the point at all. Sitting by us…just to be close…as we lose ourselves in mesmerized focus. Smiling at the fruit of our imagination. Finding our angst amusing. Poking fun at our snarkiness. And I wonder if He sees ALL of us. And, delights. Smiles. Sighs at the beauty. Stunned by our sweet carelessness. Thoroughly enjoying His creation…who He created…us. You. Me.